Thank you McCormick® for sponsoring this One Pan Baked Garlic Herb Chicken with Scalloped Sweet Potatoes post. All opinions are my own. Juicy Garlic Herb Chicken baked in ONE PAN with Parmesan mozzarella Scalloped Sweet Potatoes! This Garlic Herb Chicken with Scalloped Sweet Potatoes is a meal-in-one dinner that is knock-your-socks-off delicious and destined to become one of your new favorite dinners! Impressive enough for company, easy enough for everyday! Oh my goodness you guys, I could eat this entire pan of Garlic Herb Chicken and Scalloped Sweet Potatoes all by myself and giddily savor every flavorful, juicy, melt-in-your-mouth second of it. AKA I crave this chicken like no other. And so will you! You will also love this Garlic Herb Chicken and Scalloped Sweet Potatoes like no other because the chicken AND the potatoes bake right in ONE pan! 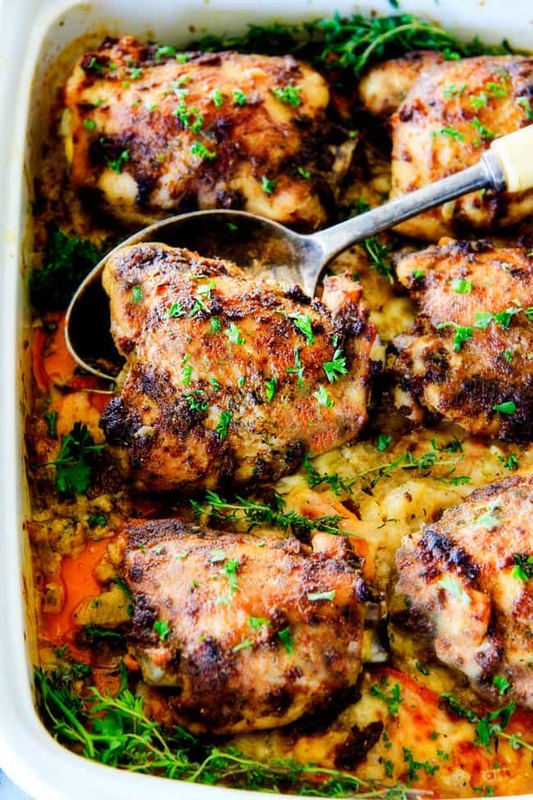 We still use a second pan to brown the chicken – but the actual chicken and potatoes bake in one pan – so both your main dish and your side dish are ready at exactly the same time with no extra hassle. 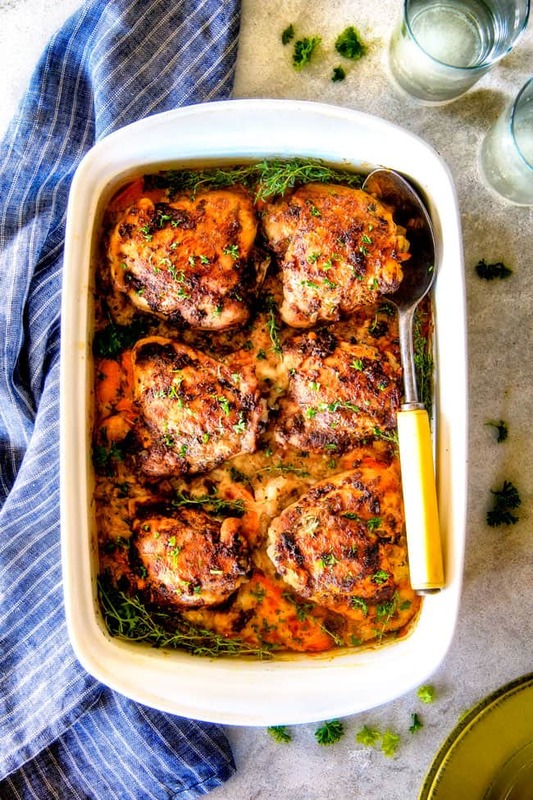 Now you might think that is the best perk of the one pan dish, but the BEST part is that as the chicken thighs bake, their spice rubbed juices soak into the layers of sweet potatoes for the most flavorful scalloped sweet potatoes. So now we have the best Chicken + best scalloped sweet potatoes = the BEST meal! What makes the chicken so restaurant worthy is the delectable Wet Rub of some of your pantry staple spices. 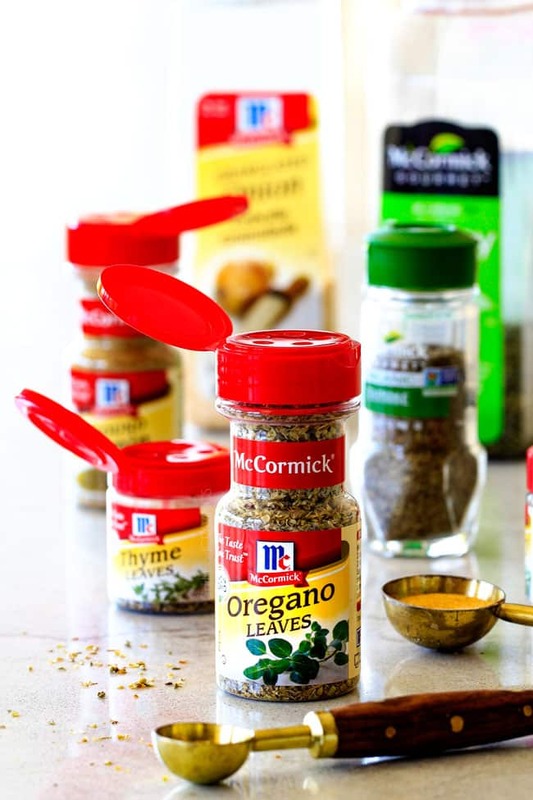 I don’t cook anything without my staples of McCormick® Salt, McCormick® Black Pepper, McCormick® Onion Powder and McCormick® Garlic Powder. You add those seasonings to just about anything in the right quantity, and you are going to have a flavorful dish. Now, to create this Wet Rub, we add those seasonings along with McCormick® paprika, dried parsley, oregano thyme and cumin to splashes of Dijon, soy sauce and olive oil, and mix them all together. We rub 1 tablespoon all over our chicken, sear our chicken and then smother our chicken with the remaining rub to bake. 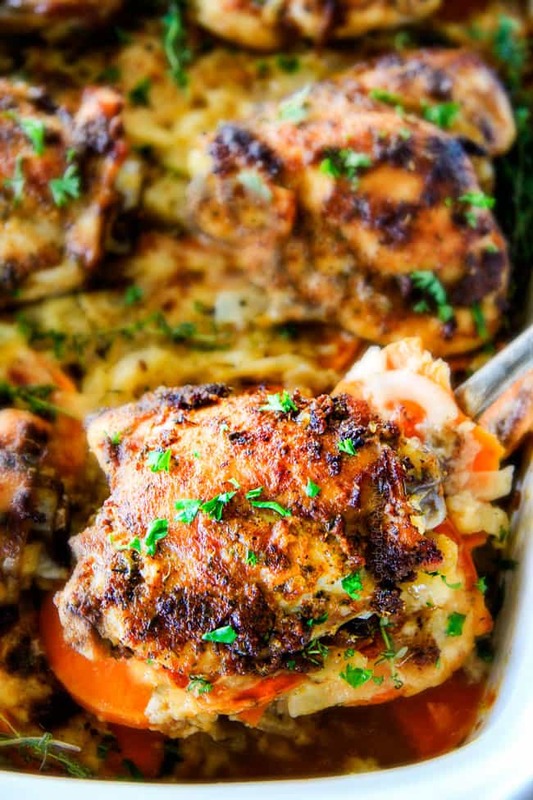 Once you taste this Baked Garlic Herb Chicken, I guarantee it will become your new go-to Wet Rub with our without scalloped potatoes. To the juices in our now empty searing skillet, we whisk in 1 tablespoon flour followed by milk (made lighter with no heavy cream! ), sliced onions, garlic, dried chives, salt and pepper. Bring this to a simmer for just 5 minutes or so to thicken. The onions and garlic will continue to cook in the oven and unlock their aromatic flavors. We then toss our thinly sliced sweet potatoes with the sauce so they get completely coated. Then layer potatoes, cheese (as much or as little as you like) potatoes, cheese and chicken. The entire meal may look impressive but is actually quite simple and rather quick to assemble. The only key to success is to slice your potatoes no thicker than 1/8″. We want our potatoes to be done cooking at the same time as our chicken so it’s better to error on the side of thin potatoes – it’s better to have softer potatoes with fully cooked chicken then al dente potatoes with fully cooked chicken. As far as the actual chicken, I prefer skinless, bone-in chicken thighs for extra juicy and wonderfully economical chicken, but feel free to use chicken breasts as well (with adjusted cooking time). Just be aware that the leaner the meat, the less juicy the chicken. You will want to rub and sear the chicken breasts just like the chicken thighs but don’t add them to the top of the potatoes until the potatoes have been cooking 30 minutes – then add the chicken breasts the last 20 minutes as they don’t take as long to cook and we don’t want them to dry out from cooking too long. (THIS IS FOR CHICKEN BREASTS ONLY). Now I will leave you to giddily devour your entire pan of Garlic Herb Chicken and Scalloped Sweet Potatoes. The meal you will crave like no other. 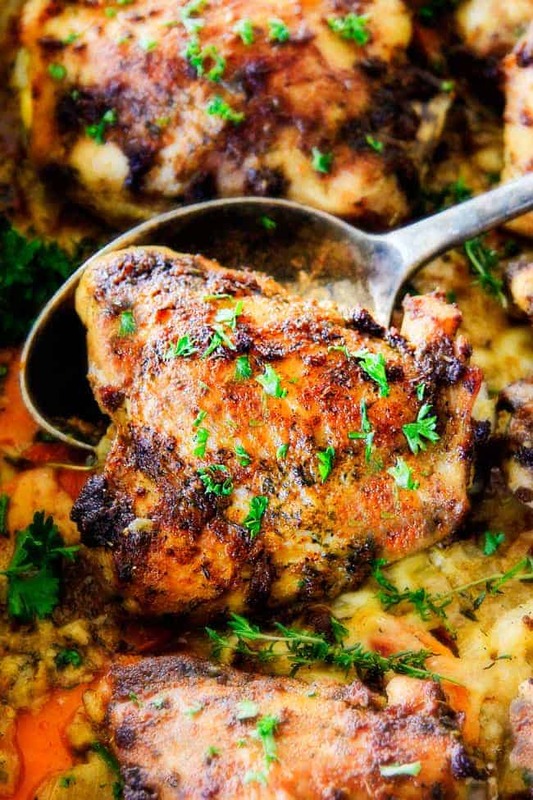 Want to try this One Pan Baked Garlic Herb Chicken with Sweet Potatoes? Pin it to your CHICKEN, DINNER, ONE POT Board to SAVE for later! Juicy Garlic Herb Chicken baked in ONE PAN with Parmesan mozzarella Scalloped Sweet Potatoes! 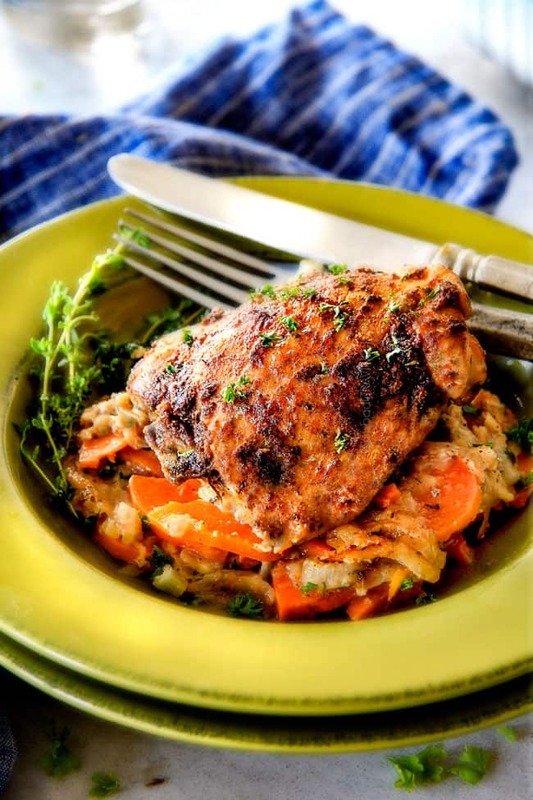 This Garlic Herb Chicken with Scalloped Sweet Potatoes is a meal-in-one dinner that is knock-your-socks-off delicious and destined to become one of your new favorite dinners! Impressive enough for company, easy enough for everyday! Combine all of the Wet Rub ingredients together in a small bowl. 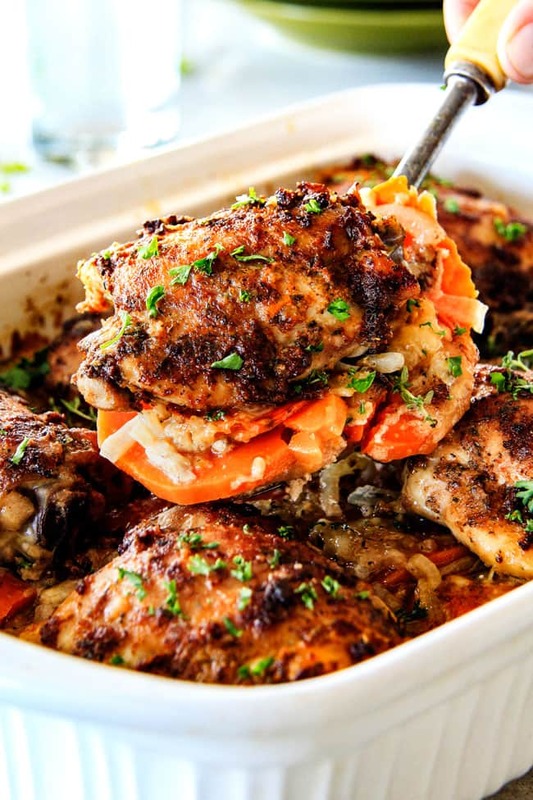 Remove 1 tablespoon and rub this tablespoon all over the chicken. Heat 1 tablespoon olive oil over medium high heat in a large skillet. Once very hot, add chicken and brown 2-3 minutes per side. Remove chicken to a plate. (Don’t clean skillet) Once cool enough to handle (you can wait until you’ve sliced your potatoes), smother the chicken with the remaining Wet Rub. Drain all but approximately 1 tablespoon grease/juices from skillet. Whisk in flour and turn heat to low. Slowly whisk in milk. Add all remaining “Herb Sauce” ingredients to now empty skillet. Bring to a boil then reduce to a simmer until thickened (approximately 3-5 minutes, it should be quite thick), stirring occasionally. Meanwhile, grease a 9x13 casserole dish and slice potatoes into 1/8” slices. Layer half of the potatoes/onions/sauce mixture evenly into your greased 9x13 pan. Top with half of the Parmesan and mozzarella. Repeat layers. *There will be some juices released when the chicken is cooked that accumulate at the edge of the potatoes which is normal. You can ignore, spoon over chicken or dab off excess with a paper towel. Is the cook time different for boneless skinless chicken thighs? Absolutely. Chicken thighs will only take about 20 minutes to cook, so add them after the potatoes have been baking for 30 minutes. I made this last night! It was pretty good overall, but not sure if i did something wrong, it came out pretty soupy. I expected some juices to come out as it says in the recipe, but the potatoes werent as creamy as had expected. chicken was delish! Hi Alexandra, I’m so happy you liked the chicken! AS far as the potatoes, I’ve never had that problem, I’m wondering if the Herb Sauce was thickened enough before you added the potatoes? It should have been pretty thick. The potatoes also need to be sliced thin enough for them to cook at the same time to become nice and creamy. Hope that helps! Hello! In your description, you say to wait to add the chicken until the potatoes have been cooking for 30 min, however in your actual recipe, you say to add the chicken in the beginning right after layering the potatoes. I am making this right now, so I will let you know how it turns out! Can’t wait! I’m allergic to sweet potatoes 🙁 so I am going to try it with regular potatoes. Is the dijon mustard amount measured in powder or liquid form? Also, what is the time adjustment if using boneless chicken breasts? Hi Nadine, the Dijon is liquid, the mozzarella is shredded. For chicken breasts follow the directions for the thighs with the rub and sear but add them to the potatoes after the potatoes have already been cooking for 30 minutes and continue to cook for another 20 minutes or until the chicken is cooked through. Just be aware that the leaner the chicken the less juicy. I can’t wait to try this! All your recipes are so delicious and this one looks no different. Also, THANK YOU for including adjustments for chicken breasts. Big help! What a nice comment to wake up to Laura, thank you so much! 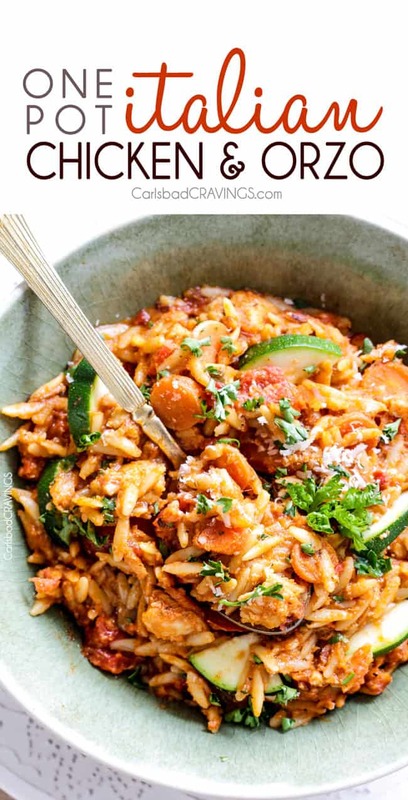 I hope you l love this recipe just as much! Happy weekend! I made this last week and we loved it. Especially the potatoes…they were delicious. We do not usually cook with so many flavors and spices so hubby was a bit unsure if he liked the chicken (mine had a glob of seasoning on the top). I used 3 breasts instead of 6 thighs so I probably had way too much of the wet rub on the chicken. But even with that…the more I ate it the more I fell in love. You have a gift sweet lady…thank you for sharing it with the world. Many blessings. Hi Amber, I’m so happy you loved this recipe! Using only 3 chicken breasts is definitely why you weren’t sure about the chicken as that is double the spice rub on each chicken breasts which is way more than intended. If you use 6 next time or use 3 and half the spice rub, I’m sure you’ll love the chicken as much as the potatoes 🙂 Thank you for making my recipes! I have family who work opposite shifts and sleep opposite times, but we all eat together, unless one has to study right after work. so many of you dishes I can prepare in small casserole dishes and bake at different times. I need a bigger fridge! That is amazing and wonderful that you make such an effort to all eat together even with your different schedules! I am so happy my recipes are working for you to make ahead of time! Made this tonight and it was a very good meal! Thank you Stephanie! I’m so happy you enjoyed it! YAY! Thank you for such an awesome comment! I am thrilled you loved this soup so much and I’m sure the work staff will be thrilled with your generosity 🙂 Thank you Stephanie! This is actually awesome. I’ve tried SO many recipes that have promised to be amazing and easy, this, I repeat, this is the only one that was actually easy as well as FREAKING AWESOME. Mine came out soupy because I could not for the life of me get the mixture to thicken, but I’m not mad about it. Thank you! I’ll try more of your amazingness soon. Hi Kelsey, I’m so happy you loved this recipe!!! As far s getting it to thicken – I would cook at higher heat for a longer period of time – that should do the trick! I hope you enjoy my other recipes just as much! Could this be prepared the night before and baked tge following day? Hi Robin, I’m not sure if the potatoes would soak up too much of the sauce overnight so it won’t be as moist the next day. It would probably be fine but that is my hesitation. Please let me know if you end up trying it!